Amazing Tails is a Delaware-based nonprofit 501c(3) organization formed in 1999 to train assistance dogs to meet the specific needs of our clients. Our operations are based in the scenic rolling hills of southeastern Pennsylvania in the picturesque town of Oxford. Our distinct location provides us with the opportunity to expose our dogs in training to a world of experience, including visits to Amish farms, as well as training opportunities afforded by large city environments such as Philadelphia and Washington, DC. Amazing Tails has extensive experience training dogs for a wide range of skills. We focus on the training of four specific types of service dogs: support dogs, wheelchair dogs, alerting dogs, and hearing dogs. Support dogs are trained to work with people who need assistance with balance and stability, walking, and momentum. Our wheelchair dogs are trained to accompany and assist people using wheelchairs or scooters. Our alerting dogs, which include seizure alert and diabetic alert dogs, provide early warning prior to an episode and are trained to respond based on the individual’s needs. Hearing dogs are trained to work with the hearing impaired by alerting them to sounds, such as alarm clocks, ringing phones, fire alarms, and other required sounds. Additionally, while we don’t specifically train dogs for it, the presence of a dog can be calming and provide emotional support to those who need it. There are many different methods and techniques used in the dog-training world. We use positive reinforcement training techniques, which vary depending on what motivates each dog. Some dogs are highly motivated by food rewards, some prefer praise and some like ear rubs. We teach our support and stability dogs a skill called “bracing.” Bracing is when the dog becomes a stable platform that the client can use to safely stand, sit or transfer to a different position. Individuals in wheelchairs often have difficulty picking up dropped objects, such as phones or remotes. We train wheelchair dogs toretrieve these objects. Alerting dogs are special. 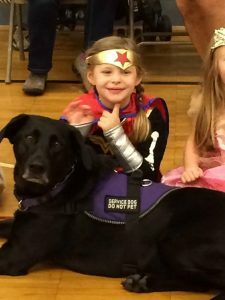 They are paired with a partner who has seizures, and the reason they are special is because a dog cannot be trained to detect and alert that a seizure is imminent. This is a skill the dog must naturally possess, and Amazing Tails trainers are able to identify which dogs will alert. For example, minutes prior to a seizure these dogs display uncharacteristic behavior such as ignoring a command, staring, or sitting in front of the person and refusing to move. Hearing dogs are trained to behave in a specific way when they hear a particular sound, such as a phone ringing, a doorbell or a fire alarm. For example, if the dog hears a doorbell it can be trained to run back and forth between the person and the door, alerting the person to a visitor at the door. Additionally, a hearing dog can warn of danger, such as a stove left on or to a life-threatening situation like a burglar or fire. Our clients come from all walks of life: from young children to older adults from all across the country. Some of our clients are confined to wheelchairs. A dog can help them to open doors, retrieve dropped objects, turn on lights, transfer from chair to bed, to list just a few. Ashleigh and her dog Sara are a new team. Together they open heavy doors, enabling Ashleigh to go to work independently. Sarah retrieves items Ashleigh needs. She carries shopping bags and pulls a grocery basket, allowing Ashleigh to shop unaccompanied. Many of our clients have difficulty with stability and balance while walking. A dog with a fixed harness handle enables the person to walk with security, a more natural gait and in a straighter position. This capability makes the client is less likely to fall. One of our clients, Marian, recently suffered a stroke. Her dog Winston provides the stability and momentum necessary to walk rather than use a wheelchair. He gives her the confidence to walk longer distances and climb stairs, by allowing her to build her strength and stamina. We have a diabetic alert dog named Benjamin. When he detects a drop in Cheri’s blood sugar, he first alerts her and then is trained to respond by retrieving her blood sugar test kit. Dogs who alert to an oncoming seizure keep their person safe by preventing them from engaging in unsafe activities like climbing stairs or crossing the street. Hearing impaired clients find life difficult, and sometimes dangerous, because they are unable to hear the sounds around them. Hearing dog Raven has enhanced the life of her partner Vivian by signaling when a teakettle is whistling, when her phone is ringing, and when the fire alarm is sounding. She also warns Vivian when people are speaking to her and when people are approaching behind her. These are just a few ways that Amazing Tails service dogs can help people. The possibilities are as diverse as our clients’ disabilities.